About That Airstream Life — MYBELONGING - High Fashion, Menswear Streetstyle Meets Food, Travel and Editorial Experiences. There's nothing quite like truly disconnecting, checking into an airstream Airbnb and kicking back with a chilled IPA up in the Malibu mountains. I've never been one to camp out on rugged terrain (tents and pests are a not a good mix for me) but -- put me in an airstream and I suddenly become a happy camper. Pun intended. What do you mean there are Golden Road IPAs and free-roaming wolf pups? Get. out. of. here. Malibu mountain views so elevated that your sunsets are lit AF? Even better! Sign me up. I'll be there in a millisecond. 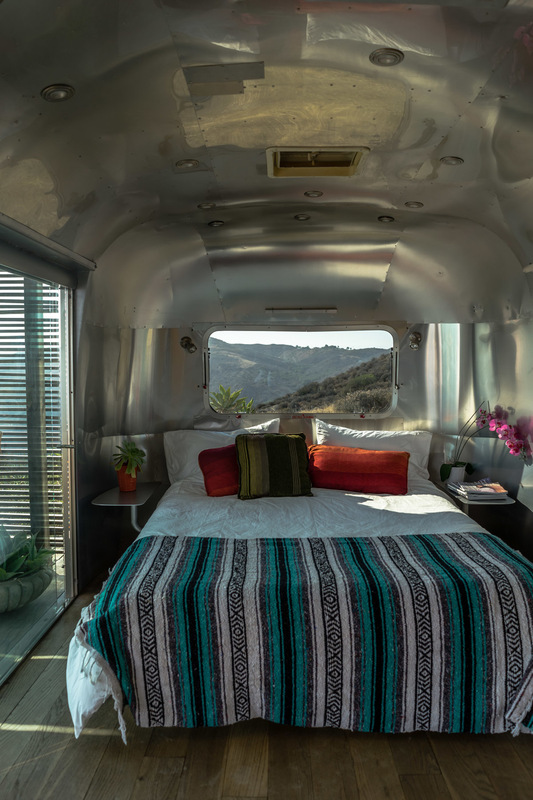 If I haven't convinced you enough to start your own airstream wishlist on Airbnb, you should right this minute. Wolf pups aren't just some mystical creature that only exists in our imagination. They're very real up here. Want to pitch a tent? Be my guest. What happens when your meal is entirely cooked by the campside fire? Deliciousness ensues. An outdoor dining experience that easily rivals a Michelin-star restaurant. For those of you who follow along on Instagram, this is an extended version of that. It was such a thrill to get a taste of that airstream life. The lack of reception was a welcome reprieve from all the endless digital responsibilities we put on our shoulders and minds. When one dedicates every waking moment to their phone or another form of digital distraction, we lose out on genuine encounters or that life-changing view ahead of you. It's an opportunity for us to recharge and reconnect with ourselves, with the world around us. I would relive all of this in perpetuity if I could, whilst sipping on all the IPAs.